Size matters, of course, but so does cost, intended use, and number of axes. Form following function is a weather worn adage, but its inverse is perhaps more relevant when choosing a CNC router. Function following form makes a lot of sense when one thinks of ‘form’ as the physical size and shape of the parts being made, and ‘function’ as the ability of the machine to make those parts in an uncomplicated, intuitive and cost-effective manner. What forms do I wish to continue building? Which ones would I like to drop from the catalog? And what new forms would I like to be able to add in the near future? The size, shape and volume of parts that you process (or plan on processing) will determine the type of machine that you buy or lease. For example, shops making stair parts or picture frames will have different needs than businesses that create signs, or build cabinets, or perhaps make RTA institutional furniture. So, what are you making? Is it profitable? And is the CNC a way to make the current operation more efficient, or an attempt to expand your offerings and enter new markets? Or both? Or do you see it merely as an alternative to hiring another worker to make more of what you are already making? Examine your motives before researching machines. Having a good roadmap is essential if you want to arrive at a certain destination, and you should know where that destination lies before you start the buying process. 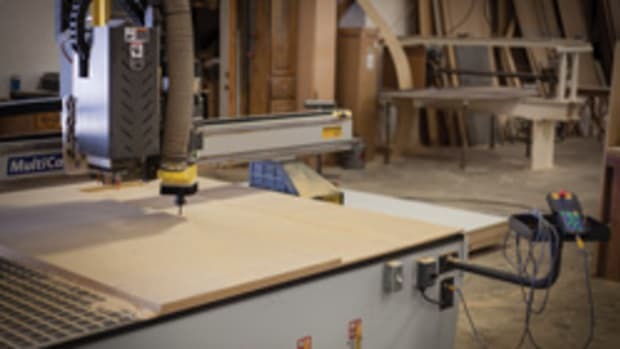 The practical work area on a CNC router is determined by the physical size of the table, less any allowances that need to be made for external restrictions such as clamping, gantry and spindle movement, and perhaps dust collection. But quite often, some of those restrictions can be overcome with a little ingenuity. Anyone who has ever installed shingles or laminate floors will understand the concept of tiling. It’s when you take small, uniformly sized units (tiles) and combine them to cover a large area. Well, many small CNC machines can do exactly that. They can break a project into a number of small parts and machine each before combining them to create the whole. That way, a small machine can process a large project. This is especially true when the worktable is open-ended so that a project is limited only in its width, and not in its length. Tiling also works beautifully for the new generation of mobile CNCs. These are small machines that are clamped to the work, or follow a toolpath that is determined by sticky tape that is attached to the work. They can mill an area such as a carving on a large beam, and then be moved along the beam to complete the next couple of feet of carving. In this way, the dimensions of their coverage area are essentially unlimited. Unfortunately, tiling can often involve a lot of set-up. So, it’s usually a preferred solution for one-off jobs and prototypes, but not so much for production work where a lot of repetition is required. Very small CNC routers often lack the muscle or stamina to turn out multiple parts all day long. That is, they can lose their accuracy over time, and components might wear out prematurely if they are generating or absorbing heat for long periods of time. Most very small machines simply don’t have enough mass in terms of an aluminum, steel or cast-iron skeleton to absorb continuous duty cycling. Others lack horsepower in both the router/spindle and also in the small motors that move the spindle through several axes. So, be sure to discuss in detail with a salesperson not only the type of projects you anticipate building now, but also the volume of parts that will need to be made over time, and the continuous hours that the machine will run. Even short production runs can quickly overwhelm a machine that is essentially designed to build prototypes, so your salesperson may suggest something more robust. Controls (how you personally interact with the machine, but also how your drawings become toolpath instructions) can require some decision-making, too. Many CNCs require that a laptop or desk computer is permanently attached. Others have stand-alone control units that can accept drawings and other files, usually via a USB connection or a memory stick, but also on a wireless connection. And some can be run by a smart phone or a tablet, and often remotely, through some very clever apps. But the issue isn’t really the manner in which the machine gets its instructions. It’s more about what you intend to send, rather than how. For example, how much programming and design work do you intend doing in-house? Can you draw cabinets, or do you have somebody on staff who can? Do you even want to learn this new skill? Are you conversant enough with your computer to use a library to choose and/or make changes to stock drawings, so that they will meet all of your customers’ needs? Do you want to invest in a CNC that essentially runs itself: you just load the material on the infeed table, choose and size the cabinets to make, and turn it on? Or do you need something that can be run on the shop floor from an office upstairs, or perhaps via a smart phone from the jobsite or even while you’re making sales calls or doing estimates, because that’s where you spend most of your time? Are you even building casework? If not, the kinds of solutions outlined above may not be appropriate. Perhaps you need more hands-on involvement, especially if you’re building unique furniture or parts. If the emphasis will be more on complex design, then you may need to look at a CNC with more than three axes, or at least one that can accept an aggregate head. This is a device that can add the ability to work at angles other than the traditional zero and ninety degrees of a standard spindle. It, in essence, adds more axes (we’ll talk about those in a minute). Again, it all comes down to deciding what you want to make before you shop, rather than buying a machine that the brochure promises can do amazing things that you’ll never need to do – especially if it can’t do that one thing you need it to. A small shop doesn’t necessarily need to limit itself to a small machine, but let’s start there anyway. When one includes the influx of technology from the Far East, there are lots of viable small machines on the market. 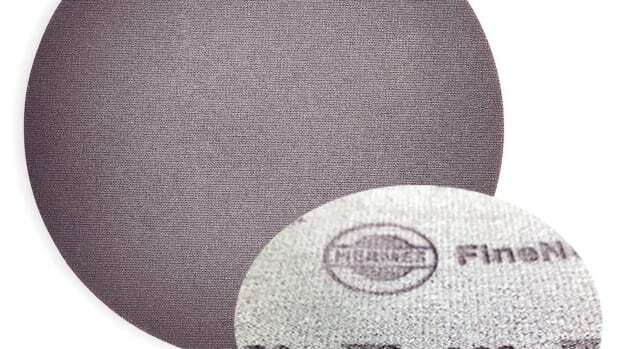 However, there is a certain comfort in dealing with a local supplier and a domestic machine, or at least a foreign company that has a physical presence in North America. Plus, with the current trade war, the cost of imports is escalating and the one option that overseas manufacturers may have to pursue to stay competitive is to buy cheaper parts, or simplify the production process. The administration is also looking at ways to limit foreign technologies, or foreign ownership in U.S. companies that manufacture sophisticated machinery, and we don’t yet know how that will evolve. There are a number of world-class U.S. manufacturers of both desktop machines and stand-alone units, and together these fit into one popular description of small CNCs. 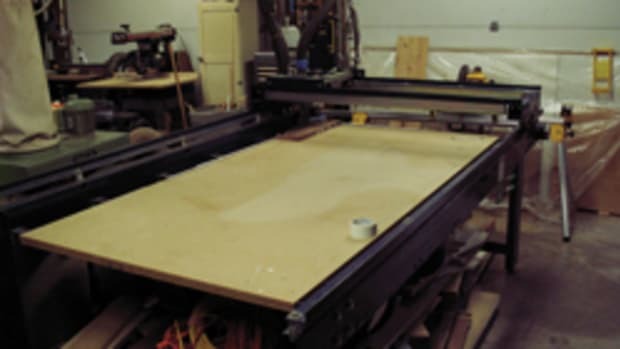 It includes machines that have the capacity to handle projects that measure less than a half sheet of plywood (that is, the working area is less than 48” square, or 24” x 96”). It’s not a perfect description, as it doesn’t address the spindle quality, the travel speed, the tool holder or a number of other characteristics such as rigidity, clamping and dust collection that are often make-or break-issues for buyers. 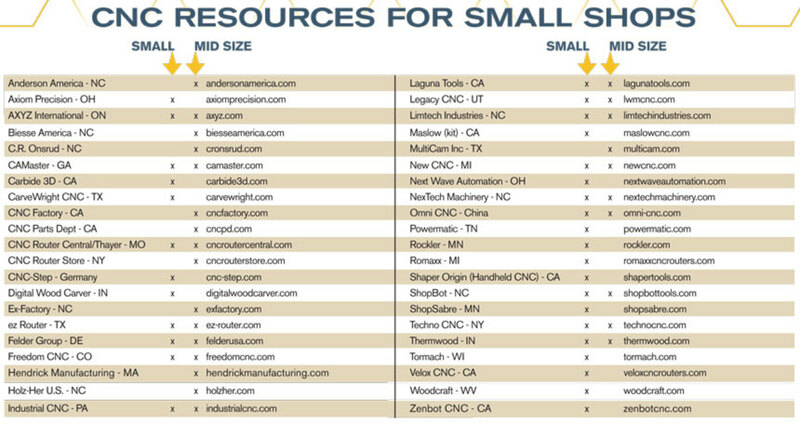 Small CNCs are ideal for serious hobbyists and small professional shops that have limited floor space. They’re also perfect for woodworkers who build one-off custom furniture, or perhaps tackle projects such as unique musical instruments or gun stocks. 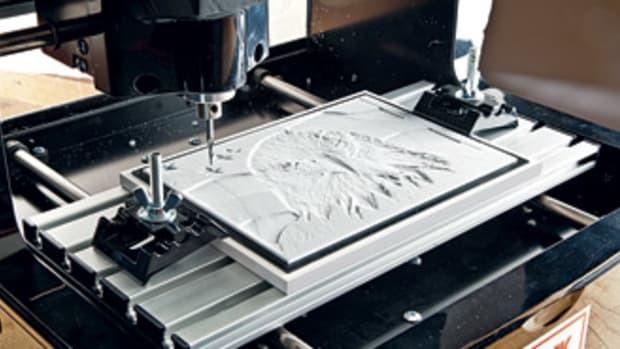 These machines can also carve details or reliefs in cabinet door panels, or create finials and corbels, mill impressive wooden handles and knobs, make fireplace mantle brackets and recreate historical carvings or trim details. 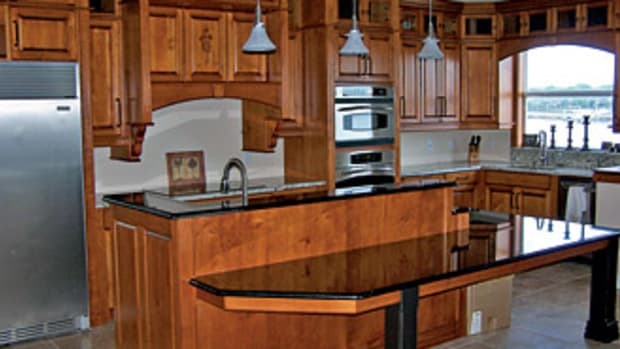 They are generally not designed for turning out base or wall cabinets all day long, but there are lots of exceptions. 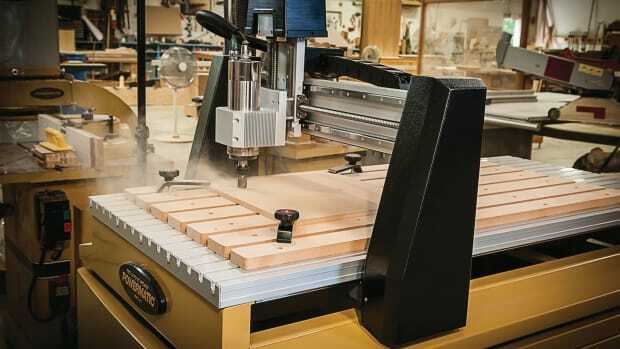 Many cabinet shops operate quite well with less than a full-sheet CNC. If your parts are small and you need a lot of them, you can certainly upgrade to a full sheet machine and then optimize (let the design software decide how to get the largest number of parts from a sheet). Or you can go with a smaller worktable and pre-process the sheet stock to fit some of the sturdier, more rugged, yet smaller stand-alone machines. 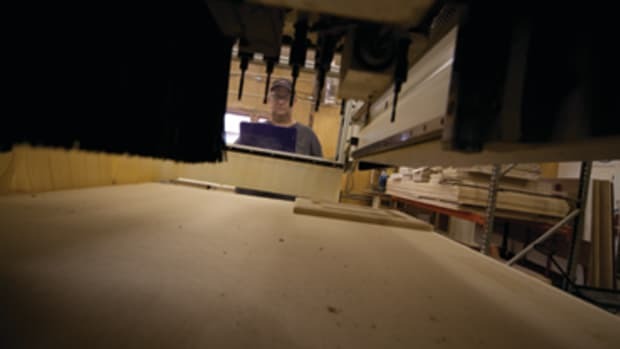 In some cases, a sheet stock supplier can help by cutting full sheets into manageable sizes that will fit your new CNC’s table, and do so before the product arrives at the woodshop. To do that in-house, a vertical panel saw may be in order. For shops that lie somewhere on the cusp here (can I get by with this tough, smaller machine or do I need a full-size version? ), experience suggests that you might want to upgrade to a water-cooled spindle and a full-sheet (49” x 97”) bed if you intend building tall items such as pantry cabinets or closets. Also, be aware that some small machines have fairly constricted movements in the Z axis (the height of the workpiece that they can mill or shape), which renders them at least challenging when it comes to making or reproducing some larger architectural details. Beyond routers and spindles, small CNCs are also used to mount and control laser and other heads such as additive 3D printing technology. So, it’s a good idea to ask your salesperson about the potential those options hold for your market. Being able to do more than one process means that, when the primary projects are all done, the machine can still be put to work doing other things, or even rented out to artists and other local users to help defray the cost of ownership. It wasn’t so long ago that a discussion of CNC for smaller shops stopped at desktop and small floor models. But today the price of entry-level, full-sheet, CNC routers has dropped so much that budget is not always the primary restriction. Indeed, physical space is probably the most salient obstruction now: some one or two-man shops simply don’t have room for another large machine, or the power and dust collection infrastructure to support it. The decline in price is in large part because the demand for, and thus the volume of, components such as motors and spindles has increased. Plus, the widening interactivity of the electronics environment (described as Industry 4.0) has also caused many aspects of CNC to become more mainstream, and thus more affordable. 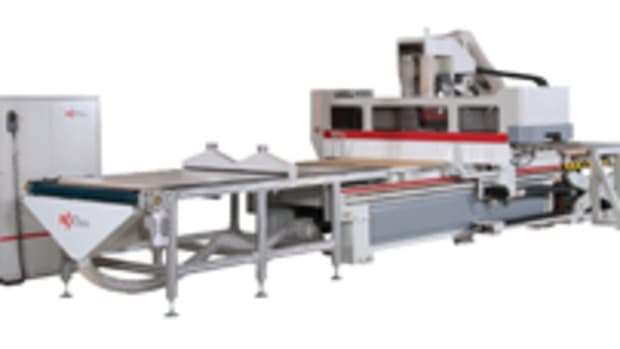 Today, the cost of a basic, acceptable quality, full-sheet CNC router is somewhere around the cost of paying an employee for about six months. And for that you get a machine that will work for several years, isn’t limited to a 40-hour week, adds a serious degree of precision to your work, makes parts and entire projects very repeatable, doesn’t require vacations or workers comp insurance, and even has some residual value as a trade-in. However, a mid-size machine that can handle full 4x8 sheets of plywood or MDF will require a much larger footprint than the actual sheets. Just like a table saw, you’ll need enough space on either side of the machine to feed material and also to remove, stack and sort completed parts. A slightly larger machine also offers the ability to add more accessories, use larger cutters or more robust bits, upgrade the automatic tool holder options, and have enough space to create new clamping solutions. And a larger machine often offers the ability to upgrade spindles, add vacuum hold-down systems, consider automatic loading and unloading, and in general grow as your needs grow. One of the biggest factors determining the cost of your new CNC will be the number of axes for which it is rated. A 2.5-axis machine can move in three directions (left and right is X, back and forth is Y, and up and down is Z), but can only do two of those three at the same time. A basic 3-axis machine (by the way, X, Y and Z are collectively called the Cartesian Coordinates after the mathematician Rene Descartes, who was the first to name them) can travel in all three directions as it follows the toolpath. 4- and 5- axis machines move in the three basic directions, but they also add one or two rotary axes to those. That is, the cutting tool can rotate in one or two extra planes so that it can approach the work from more directions than a simple vertical spindle. A 4-axis machine’s spindle rotates around the X axis (that is, it swivels left and right, and this new path is called the A axis.). And a 5-axis machine does all that and also rotates on the Y axis (swiveling back and forth, which is called the B axis). So, a 5-axis machine can pretty much mill anything in any direction, including 3-D carving. The ‘5’ simply refers to the number of directions in which the bit can be moved. Think of a cube of wood sitting on your CNC bed. A cube has six faces. A 5-axis machine can work on five of those six faces (that is, all faces except the bottom). If you only have a 3-axis machine, it can work on the top and can do limited cutting (as it uses the side of a vertically-mounted tool) on the other four visible faces. But the 5-axis machine can rotate the tool (let’s say it’s a drill bit), and plunge straight into those other faces so its point touches rather than its flanks. If you’re considering investing in 5-axis machining, think about this: there will be less set-up, less possibility of a spinning bit running into the tool holder or the gantry because it can ‘bend’, and longer tool life (the edge stays sharper for longer), because the tool can be used in its most efficient orientation, and thereby maintain a constant chip load. With the unbelievably rapid evolution of industrial robotics and their consequential decline in price, it won’t be long before even small shops will be able to afford the luxury of adding a robot arm to hold our cube in place for 5-axis work. Then, once that work is completed, the arm will be able to pick up the cube and expose the final face, so that parts can be machined in all six directions. Just think of the parts even a one-man shop could make then. At that point, who knows whether form or function is taking precedence. CNC expansion: now or never?